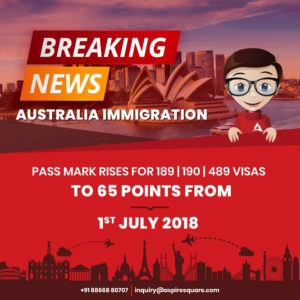 From 1st July 2018, applicants wishing to lodge their EOI for Visa subclass 189, 190 and 489 (General Skilled Migration) will require minimum pass mark of 65 points to get the Invitation from Department of home affairs. Previously the pass mark for above visa subclasses is 60 points. The five points increase in Pass mark indicates the higher interest in Skilled base immigration visa. This is an increase of five points. The new pass mark reflects the high level of interest in skilled migration to Australia and the high caliber of prospective applicants who express their interest in the General Skilled Migration program. The above-mentioned visas are fall under Skill Select programme launched by the Australian Immigration department on 01st July 2012. Skill Select is online service from which interested applicant who wants to get Australian visa can submit an Expression of Interest (EOI). Once applicant lodge the EOI in Skill Select with their skills and other detail like Age, Qualification, Experience and English Language score, then skill select issues the invitation to lodge the final visa application based upon applicants score and ranking. Invitations issued from Skill Select are subject to occupation celling and applicants personal score. State and Territories also can access skill select to issue an invitation to intending migrants. Skillselect mainly compromises with three stages. Intending applicant first needs to submit their Age, Qualification, Experience and English language ability with other necessary detail in an online SkillSelect system (EOI). An applicant who possesses the skills needed in Australian labor market and having sufficient points (Highly ranked EOI will get priority) will get Invitation by the Immigration department to lodge the final visa application. An applicant who got the valuable Invitation from department makes a visa application to the Immigration Department. If all criteria are met then an application will be assessed and get the outcome. As leading immigration agent for Australia in Gujarat, Aspire Square believe that these changes may affect your eligibility. If you require any more information or detail in regards of your eligibility for Australia Immigration then contact us on below given contact detail.